Klaartje Scheer lives and works in the city of Breda in the south of the Netherlands. 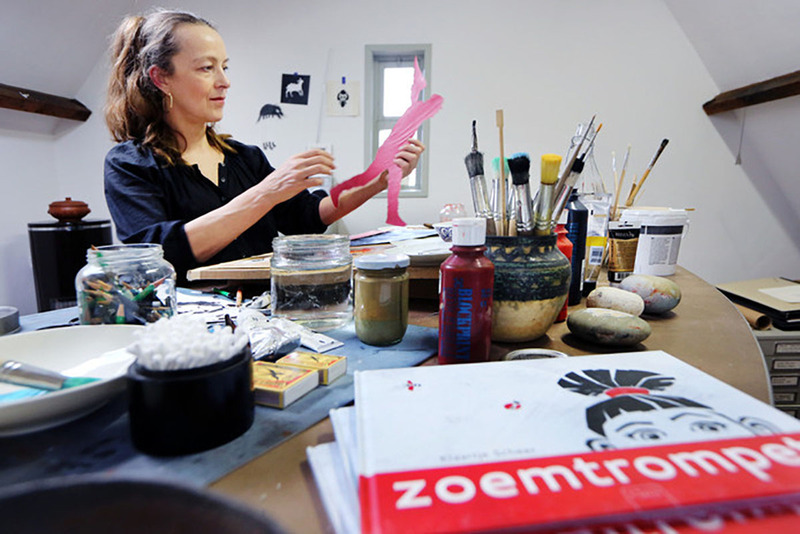 Her atelier is situated where the Zonstraat and the Maanstraat meet. Whether or not this is a coincidence, meeting points and crossroads are at the heart of her work. Klaartje’s work bears a strong personal signature. Decisions have been taken, choices made. Her images are as familiair as they are unique. We have never seen them before but somehow we know them. They make an impression of having been there all the time, taking part in an ancient language that touches our roots and deepest knowledge. However her independence and freedom do not exist without cooperation and interaction with fellow artists or pupils. Having learnt much from her own artistic education as well as from her education as an art teacher, she now teaches others of different ages and backgrounds. For this, she builds on her experience as a teacher at the educational art center ‘Nieuwe Veste’ Breda, where she was employed from 1989 to 2009. Here she also initiated and developed the ‘duo course’ in which grownups and children work together. Likewise, cooperation with other artists enables her to cross borderlines between different forms of art. Time and time again this gives rise to new starting points and new perspectives, widening her working field. Her images inspire poetry and vice versa. However, poem and image never marry. They go together for some time, then separate again. It is a bond that connects to the outside world, opening up hearts and minds. Yet there is a sense of protection, surefootedness and safety. A good example is the use of pieces of text in her picture books. Pictures and texts do not just illustrate one another. There is a lively interaction. We realize that a sign is a picture and that pictures are signs. Another feature is that a text may create harmony through contradiction, telling exactly that, what the picture leaves out.The books De toegang is gratis, Magische Schaar and Zoemtrompet (‘Free admission, Magic Scissors and Trumpet Song) are meant for children, grown ups and youngsters alike. Another example is a series of 25 iron signs attached to historical houses and shops along the Haagdijk in Breda City. For this project, she worked together with architect Eloi Koreman who realized the technical aspects. Solid material and bold shapes go together with elegance, subtlety and movement. The signs play with the weather: wind, shadow, light. They are an interpretation of the old names of the houses and places in such a way that they do not restrict but broaden the meaning. Every one of the 25 signs embodies a well-wought challenge of the tooth of time. Klaartje has been working on a project Voorbij Goed en Fout/Past Right and Wrong about war and freedom, together with her sister Ernestine scheer, who writes poems that interact with her lithographs in black, white and shades of red. Poems and graphs have been presented in performances in September 2012 and May 2013 in Tuin de Lage Oorsprong at Oosterbeek, an old restored garden situated in a place heavily disturbed in September 1944. The project Past Right and Wrong will result in a book called The Dream of the Sandman.